Will Trump start a nuclear war with North Korea? Given the improbable events of the past two years, it is almost impossible for anything to happen that would really surprise the American people. They could, however, wake up any morning to a horrific shock: mushroom clouds billowing on the Korean Peninsula. 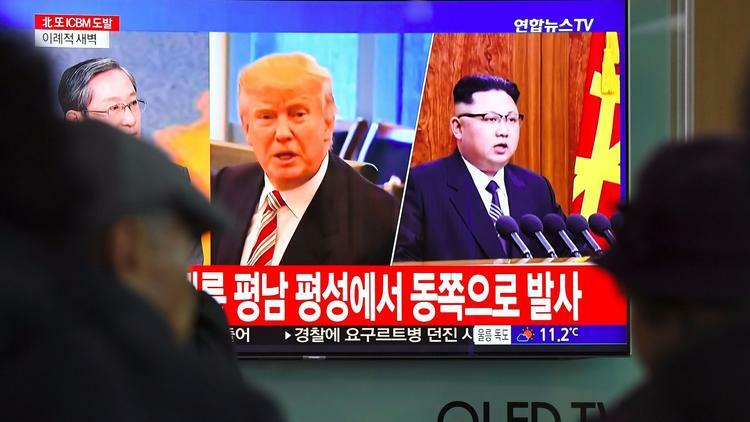 The Trump administration has given so many signals of its willingness to initiate a war against North Korea that they no longer attract attention. As with much of what Donald Trump says, the public assumes these salvos are nothing more than empty bluster. But there are grounds to think the reckless talk will lead to even more reckless action. In August, Trump told the North Koreans what to expect if they made any more threats against the United States: “They will be met with fire and fury like the world has never seen.” That warning didn’t deter Kim Jong-un from conducting a nuclear detonation and additional missile tests, part of his quest for the capacity to execute a nuclear strike on the American mainland. A growing number of important Washington figures think that prospect is so terrifying that it warrants a pre-emptive attack. National security adviser H.R. McMaster says the only option North Korea has is to give up its nukes — and “time is running out.” Dennis Blair, director of national intelligence under President Barack Obama, has recommended massive “air and missile strikes” on North Korea if it tests a missile in the Pacific Ocean. The prospect of war with North Korea appears to be far greater than most Americans realize. The administration has done very little to make the case for a preemptive attack or to prepare the public for the ghastly consequences that would probably follow. North Korea’s thousands of artillery pieces can reach Seoul, a city of 25 million, as well as Camp Humphreys, the biggest U.S. military base in the world. The Pentagon has estimated that in a conventional conflict, 20,000 people would die in South Korea each day. But there is no reason to think the war would not escalate to using nuclear weapons. The Pyongyang government is believed to have as many as 60. Even the most suffocating preemption couldn’t be expected to eliminate them all. Not only South Korea but Japan and the United States could be hit, incurring millions of casualties. McMaster has somehow convinced himself that our possession of a huge nuclear arsenal can’t prevent North Korea from using its small nuclear arsenal. How would “classical deterrence theory,” he asked, apply to “a regime that engages in unspeakable brutality against its own people” and “poses a continuous threat to its neighbors” and possibly the U.S.? But the same description fits the old Soviet Union, as well as China, and both governments were unfailingly deterred, decade after decade. Any regime that carries out a nuclear strike on the U.S. or its allies can assume it will immediately cease to exist. Kim has shown no penchant for suicide. The only circumstance in which he would be likely to fire nuclear-armed missiles is if North Korea or his regime were under surprise attack — leaving him nothing to lose. In this case, the remedy wouldn’t cure the disease; it would cause the disease. The hawks speculate that the North Korean despot would use these devices to intimidate us while forcing South Korea to accept reunification under his rule. He might figure that an American president would not risk the radioactive obliteration of Los Angeles or Washington to save a distant ally. But for Kim, the risk of being wrong on that gamble would be annihilation. And if we want to remove any doubts in his mind, we could turn over some of our nukes to the South Korean government — which would have every reason to retaliate. Graham acknowledges that the conflict would be costly. But, he says, “don’t ever lose sight of how this war ends. We win it, not North Korea.” He forgets the stark truth of the modern age: In a nuclear war, everyone loses.